My uniqueness is a badge of honor and something to be proud of. There is no one in the world quite like me, and I will strive to develop my knowledge and skills. Each person is remarkable and different. I will try to learn from these differences rather than be critical of them. I will support diversity and freedom of expression in the way people think, look, and live. I acknowledge that there is no single standard of what is right. Each person provides a unique perspective and collectively contributes to the distinctiveness of our society. We are all equal and deserve the same thoughtful consideration. 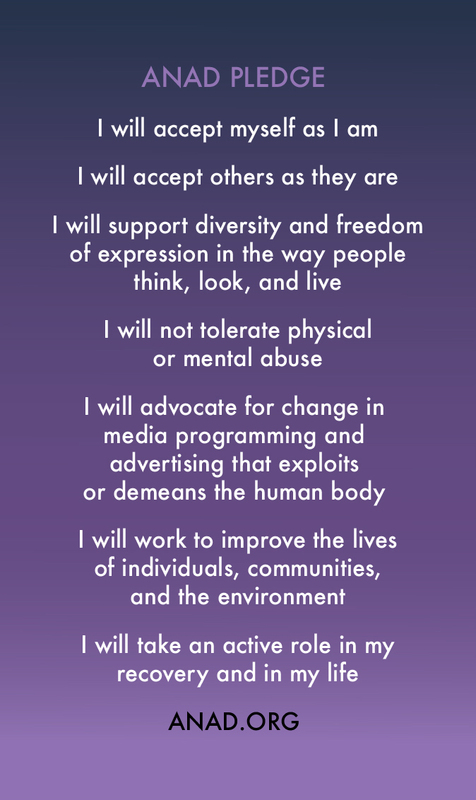 I will advocate for a change in media programming and advertising that exploits or demeans the human body. Setting standards of physical perfection is harmful to everyone. Real human beauty lies in our differences, not our similarities. I will work to improve the lives of individuals, communities, and the environment. As a responsible member of society, I understand that the more good I do for the people and places around me, the better off everyone will be. I will take an active role in my recovery and in my life. I will address good health by taking care of my mental health, having proper nutrition, engaging in regular physical activity, and allowing for adequate sleep. Having a balance enables me to achieve success in all of life’s endeavors.